March | 2013 | DEBtastic Reads! A full week later and I’m still feeling the very positive effects of attending this fabulous retreat. I loved making new friends and reconnecting with old ones. 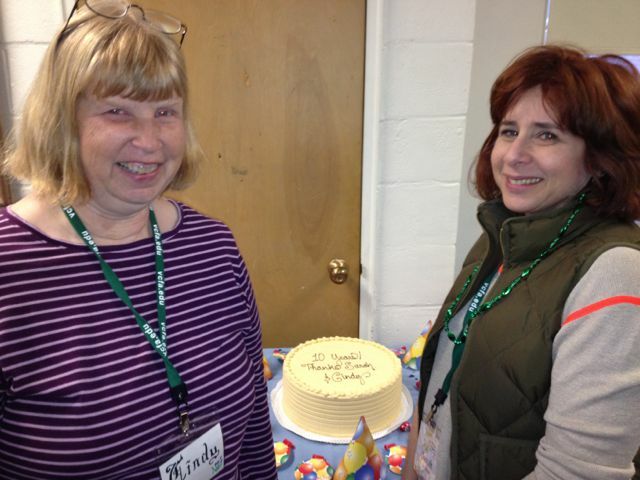 It was special to be able to room with my long time writing partner, Cindy Faughnan (who for ten years has been co-running this amazing retreat). I had a couple of first times during this weekend. First, I had never heard of Sugar on Snow! Cindy mentioned it as the Farmer’s Market was setting up in the chapel next door to our dorms. For those of you who don’t know – it’s freshly tapped maple sap, cooked and poured onto fresh snow. I snagged new friend Catey who is from North Carolina and I assumed correctly she’d never heard of it either, and the two of us headed over to the booth before lunch! (Yes, dessert before lunch!) What a delicious and special treat! The snow was scooped onto wooden troughs, the cooked maple sap ladled onto snow, and then plastic forks were stuck into the “glops”. I took a fork and slid the concoction into my mouth. YUM! It was chewy like taffy and oh so sweet, and the snow was crunchy and cold. Catey and I helped ourselves to quite a few forkfuls (after an appropriate donation). I didn’t know until after that this treat is only available for a very short period of time when the maple sap starts to run. The second first for me? I read my work out loud in public. Sure, I’ve read out loud to family and friends and during critique group meetings, but I’ve never read to a group of mostly strangers. Fortunately, the reading was scheduled on Saturday night – the second night of the retreat, so I had a chance to meet a lot of the other attendees and felt like I was in a supportive environment. Just before my turn to read, I wasn’t feeling too nervous (just the appropriate amount of nervous, I suppose), but when I walked to the podium, I made a conscious effort not to look up at the audience of 35. I read – and wow! What a heady experience to read my words out loud and to hear the reaction as I read (laughter in all the right places)! Even better was sitting down and being able to enjoy and listen to the other attendees read their work out loud – I was inspired and entranced by all the talent in the room! And now for my main take-aways from the presentations – I’m being mindful of copyright, I hope, and just giving a brief line about the main thing I took away from each talk. Each presenter gave an hour long, riveting and inspiring talk. I was so thrilled to hear what they had to share! Julie Berry – “Mind the Gap” – What are the obstacles that block you from what you are and what you aspire to be. It’s an interesting way to look at my career path. I’m giving a lot of thought to this! Cynthia Leitich Smith – World building is key, setting is the springboard for world building. Even realistic fiction needs world building. This made me think about my settings in my stories more critically. How well do I really know the world my character inhabits? How much detail is there and what details are crucial to my story? Lauren Myracle – TELL YOUR STORY! She said a lot of wonderful things, but that was the big take-away for me. Tell the story you want to tell, the one you need to tell. Andrea Tompa (editor at Candlewick Press) – Make sure the backstory serves the story. And one more thing, don’t focus on theme during the first draft – use revision to do that. I also had a critique with Andrea Tompa and let me just say, OMG, she is truly brilliant and she made me look at my story in a whole new light. (This is a WIP I put away almost 5 years ago.) I can’t wait to get back to it! I am so happy I went to this retreat! And I hope to go back again next year! Maybe I’ll see you there! I had the wonderful opportunity to attend the Novel Writing Retreat at the Vermont College of Fine Arts. This craft-focused weekend workshop is run by Cindy Faughnan (VCFA MFA grad and my writing partner) and author and writing teacher Sarah Aronson (also a VCFA MFA grad) – this one marking their 10th anniversary. This is a truly spectacular retreat and I hope to return again next year! There were two tracks one could sign up for, the critique track and the writing track. Because I’m in the final polishing stage of my WIP, I signed up for the writing track – I had blocks of 1-1/2 hours between lectures to focus on my own writing. The critique track put attendees into groups of four – and they had blocks of time to meet and workshop their WIPs. (Crit track members were sent work ahead of time to read/review.) Each crit track attendee also received critiques from the author mentors and editor mentor. From what I heard from these attendees, the crit groups were amazing and supportive and inspired! 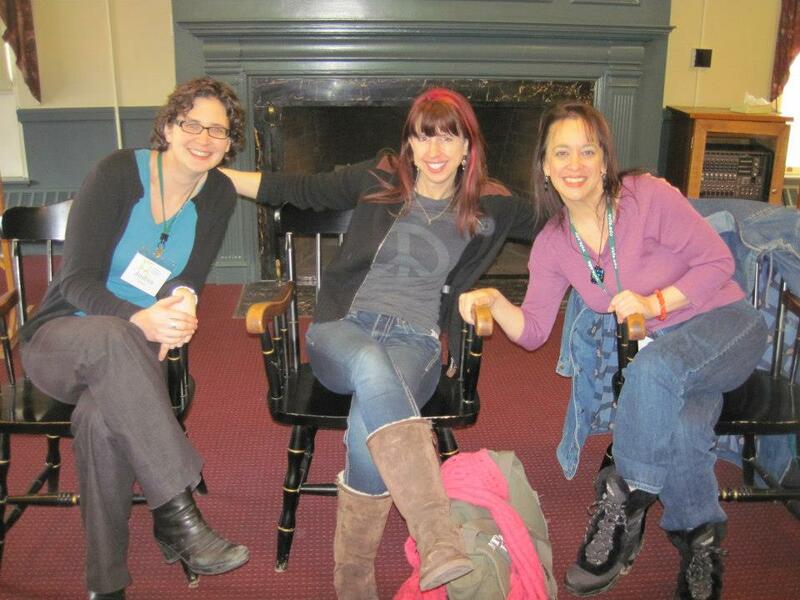 Andrea Tompa (editor at Candlewick), author Lauren Myracle, and author Cynthia Leitich Smith. (Thank you to new friend Elly Swartz for the photo.) Each gave an amazing lecture. Cynthia Leitich Smith (who is a good friend and former mentor) is the author of amazing books for kids, from picture books like Santa Knows (co-authored with her husband Greg Leitich Smith), to contemporary MG and YA books (like one of my favorites, Rain Is Not My Indian Name) to fabulous fantasy books like her Tantalize series. 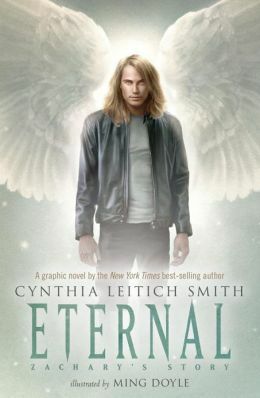 I just finished reading Eternal: Zachary’s Story, her graphic novel illustrated by Ming Doyle. Zachary is a guardian angel watching over Miranda, but when he shows himself to her in an effort to save her, he is demoted to human form. He is still committed to trying to save her soul, but Miranda has changed a LOT since he last saw her – she is no longer human but a vampire princess. I’m going to start reading her Feral Nights series very soon! Andrea Tompa is an editor at Candlewick. 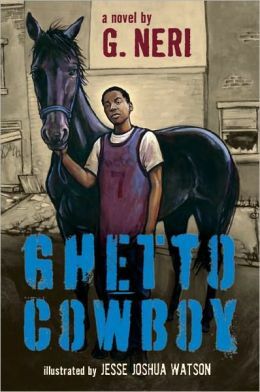 She edited Ghetto Cowboy by G. Neri (illustrated by Jesse Joshua Watson). I have to admit, this is not my usual kind of book – a MG “boy book” set in the inner-city about horses (yes, I was one of those odd girls who didn’t want a horse when she was little). But because Andrea’s talk was going to be about the editing process of this book, I decided to read it – and guess what? I loved it! I didn’t want t put it down and I had tears in my eyes when I finished it. When 12 year old Cole’s mother is fed up with his school truancy and getting into trouble, she packs him up and drives from Detroit to Philly and drops him off with the father he never knew. Cole is suddenly in the middle of a run-down horse stable smack in the city, where his dad and other Black Cowboys try to care for horses in ramshackle buildings. At first Cole is frightened of the horses and angry that his mom left him there – but he bonds with a horse named Boo, and the other cowboys (and his dad). When the city wants to shut them down and take back the land, Cole is spurred into fighting back to save the place and the horses. I recommend all the books above, for sure! I promise another post about my experience and the inspirational take-aways I got from the talks. See you Tuesday! Happy reading! I’ve posted here before about my lovely reading retreats with my dear friend, Lynn. I miss those tremendously. Since I’ve moved across the country, I still read regularly, but my energies have shifted back into writing mode. Not having family or close friends within “let’s have coffee” distance, I’ve had more time alone, and more time alone, for me, means more time spent with my stories. In the meantime, happy reading, and I look forward to catching up on reading your posts very soon! Please grab a cup of coffee (or tea if you prefer) and join me in welcoming author Kimberly Sabatini to Coffee Break Tuesday! 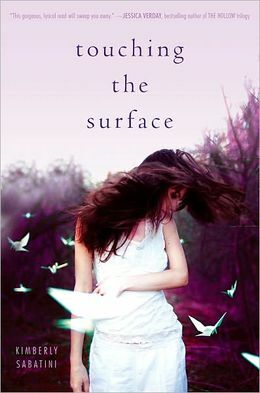 Kimberly is the author of the YA novel Touching the Surface. Teen Elliot (her name this time) finds herself at the Obmil (afterlife) for the third time. This time she knows she must Delve truly and deeply to discover why she’s not able to move on – there might be consequences. Elliot learns the truth about her life on Earth as she struggles to figure out why her best friend no longer wants to be with her. She’s also torn between brothers Trevor and Oliver. In this unique story about the afterlife, readers will be mesmerized by Sabatini’s Obmil. I wanted to be a writer for as long as I can remember. In elementary school I decided that since everyone called me Kim or Kimmie–if I ever got published I would have Kimberly as my author name. My agent and editor got a kick out of that story when they asked what I wanted printed on my book. But wanting to be a writer and deciding to be a writer came at two different times in my life. The want came from the moment I could put a pencil to paper and funnel things out of my brain onto paper. It has always felt good to me, but in my high school years, I let insecurity get the better of me. It took way too long, but the decision to become a writer didn’t happen until June of 2007 when I attended my first SCBWI Conference. For two years prior (after the death of my dad) I dabbled with the idea, but that first conference, listening to the likes of Laurie Halse Anderson and KL Going cinched it for me. I decided it was time to make my dreams a reality. Touching The Surface is my very first book and I feel very lucky that it made it all the way to the bookshelves. I began writing TOUCHING THE SURFACE immediately after that SCBWI conference in 2007 and I signed with my agent Michelle Wolfson of Wolfson Literary in December of 201. 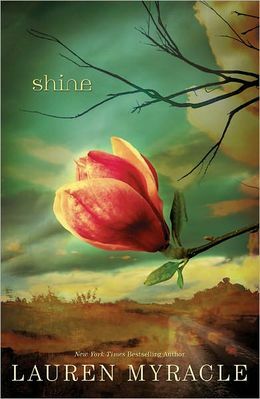 She then sold it to Anica Rissi at Simon Pulse, an imprint of Simon & Schuster in February 2011. Along the way 33 agents passed on my book, but I’m very glad they did because Michelle is the PERFECT agent for me and she found me the most amazing editor I could have ever dreamed of. I’m currently revising my second YA novel THE OPPOSITE OF GRAVITY and I’m hoping to sell it when it’s ready. It’s a contemporary novel involving dance, the Broadway musical Wicked and the need to defy—what we know to be true–in order to find the truth. I no longer write alone. Now there is a cast of characters that sneak into my office to sit on my shoulder while I write. There’s an agent, an editor, a publishing house, reviewers and readers to name a few. And while I’m grateful for all the good stuff they’ve brought to my table, I still have to be careful to spend enough time alone in my own imaginary dream world, to capture the novel that needs to be written before it is revised. THE GIVER by Lois Lowry–It felt so good to realize that there was another person in the world who thought about the same kinds of things that I did. I am currently blown away by the talent of Laini Taylor in both THE DAUGHTER OF SMOKE AND BONE and DAYS OF BLOOD AND STARLIGHT. I love these books! Her world building, character development and lyrical writing push me to be a better writer. My husband was stationed overseas in the military when we first got married, so I lived in Augsburg Germany for 4 years and got to travel all over, seeing places like Italy, England, Amsterdam, France, Hungary, Poland, Czechoslovakia, Austria, Monaco and Egypt. It was pretty amazing. Now that my kids are getting a little older I can’t wait to take them to some of the places I loved. For more about Kimberly, check out her web site, connect with her on Facebook, or follow her on Twitter.